Anyone, humans and non-humans animals with a nervous system connected to their brain can feel pain, this is because nerve relay sensations to the brain. When the pain signal reaches the brain it goes to the thalamus, which directs it to a few different areas for interpretations. A few areas in the cortex, figure out where the pain came from and compare it to other kinds of pain with which is it familiar. Let’s take a basic example, a horse that gets hit with a whip will remember the object that caused him pain and is likely to be afraid of it as soon as the cortex has figured out what have caused pain. The pain can also be associated with the person using the object that has caused pain. Signals are also sent from the thalamus to the limbic system, which is the emotional center of the brain. Yes, not only the horse is feeling pain but also he is experiencing a range of emotions such as fear, anger, distress etc. Feelings are associated with every sensation the horse encounter, and each feeling generates a physical response such as increase in heart rate. Trigeminal action type of bits. (Curb types) inflicts pain primarily to the branches of the trigeminal nerves. Dental effect type of bits (Snaffle types) inflicts pain primarily onto the bars, the teeth, the tongue and palate. It is essential to understand that there is absolutely nothing the user can do to stop the horse from feeling the pain inflicted by the bit, this is due to how the bit being created to work, where it being placed and how the horse’s nervous system is designed. The diagram below is one of the most comprehensive diagrams I have found. A larger version is available for download at the end of this page. V1 is the ophthalmic nerve, it supplied branches to the eye, eyelids etc. V2 is the maxillary nerve division it comprises the principal functions of sensation from the maxillary teeth, nasal cavity, the palate, infraorbital nerve (2) etc. V3 is the mandibular nerve, it runs along the bones of the horse’s lower jaw and give off to the bucal nerves (3), lingual nerves (4), inferior alveolar nerve (5) etc. The palate, which is connected to the maxillary nerve division (V2) gets hit by the joint of the bit at each draw of the rein. We can easily identified this pain as the horse will open the mouth to escape the contact of the joint(s). Each draw impacts on the 1st and 2nd premolar teeth along with lips and bars. The inferior alveolar nerve (5), which supplies lower teeth with sensory branches and infraorbital nerve (2), which supplies premolar and upper jaw, transmit pain signals to the brain at each draw. The toothless area of the mouth was never made for the bit, but to hold the tongue, which lay very close to the horse’s palate. When the bits move inside mouth, it jams the tongue toward the larynx. The lingual nerve (4) supplies sensory innervations to the tongue and therefore transmit pain signal to the brain. 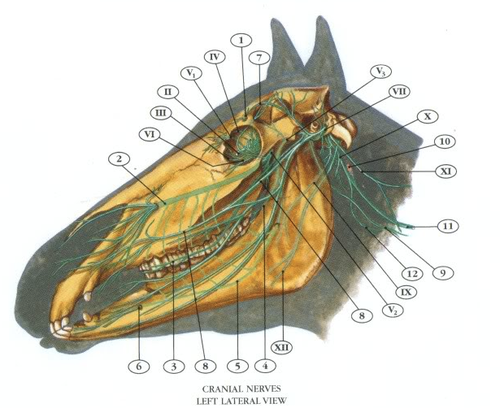 The trigeminal nerve (V3) that runs along the horse lower jaw is affected by the combined effect of a draw on the rein and the chainette tightening up. The mouthpiece of the bit hit the palatine (V2) when tossing under the effect of a small draw on the rein, more the bit got leverage (bigger branches) more significantly painful is the action of the smallest draw. Bits are not the only instruments that can cause pain, the rope halter also affects cranial nerves and therefore send pain signal to the brain. VII shows the main branch of the facial nerves. Facial nerves being nerves that are extremely close to the skin and therefore extremely sensitive to pressure applied unto the skin. “Wiggling” a lead rope connected to a rope halter, like recommended by some “Natural” Horsemanship trainers, cause pain as the halter’s knots are placed just on the buccal branches of the facial nerves (8).